Getting up at a reasonable time in the morning is one of my biggest struggles. One thing that does tend to coax me out of my snuggly cocoon, is the thought of freshening up with a fancy skincare routine. Read more below to see how I gently cleanse and prep my face for the long day ahead. I start with a light, creamy milk cleanser to cleanse my skin of the dirt and oil which accumulated throughout the night. Along with this cleanser, I use a muslin cloth from The Body Shop, moistened with lukewarm water. I love using this type of cloth because it's very lightweight, it gently exfoliates and it dries quickly, reducing bacteria buildup. 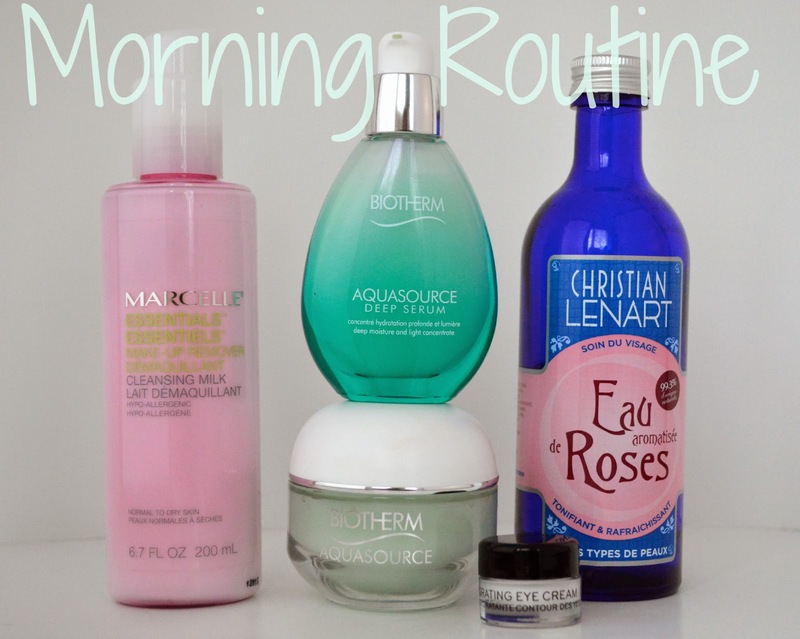 *Make sure you don't over-wash your skin in the morning. there really shouldn't be much dirt to remove, unless it wasn't removed before bed. Over-washing will result in dried out skin and can cause breakouts. Immediately after patting my skin dry with a towel, I apply a bit of rosewater. I carefully pour a few drops onto my hands and tap this into my skin. Using a piece of cotton is easier, but im cheap and this method uses less product and produces no waste. The tapping stimulates blood flow and really wakes me up. Right after toning, I'll use a light serum to brighten dark spots. I bring the serum onto my neck, sweeping in an upwards motion to reduce dryness and sagging (hey, why not start the anti-aging young). This step isn't required, but it does leave my skin looking extra supple and radiant. The Biotherm Aquasource serum works really well at brightning and goes hand in hand with the next step. I finish with Biotherm's famous mint green Aquasource hydrating gel, which is the most refresheng product ever. It's somehow astonishingly hydrating without suffocating the skin at all. After application, the gel soaks in quickly and leaves a matte finish, perfect for applying makeup. No wonder one of these beauties is sold every 7 seconds. Most days I apply a small amount of eye cream, since the under eye area tends to get quite dry in this harsh winter weather. I am currently using one from Bobbi Brown, which was part of a recent Sephora 500pt perk. The key to properly moisturized skin is applying products within 30 seconds of washing. If you allow your skin to dry out, layering a product on top will work far less effectively. There must be moisture present on the skin before layering on products so that they can actually lock in and retain the moisture. 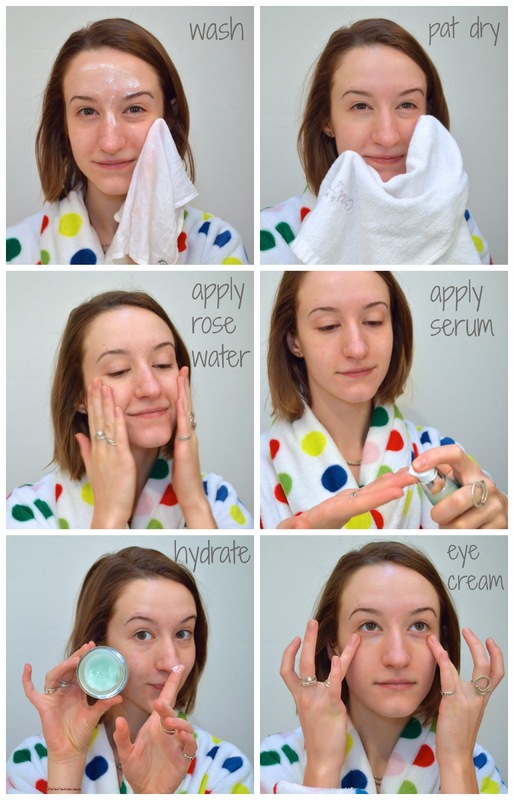 These properly executed steps will provide a very natural glow to the skin. Thank you to LOULOU Magazine for introducing me to the simply fabulous Aquasource line from Biotherm.